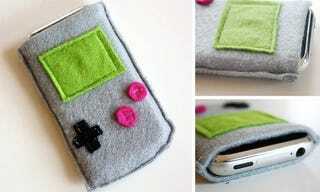 We've already seen the world's greatest Gameboy iPhone case. So what's done is done. But given that the world's greatest iPhone case is hidden somewhere in the depths of Akihabara, this runner up from Etsy might make a solid alternative. Machine sewn from various colors of felt (yet lined in simple black), this $15 Gameboy iPhone case was just listed back on July 2nd but is already "sold out."